Easily calculate and buy exact USPS-approved postage online for letters and packages. Buying postage online brings all the services of the Post Office right to your home or office. Internet postage allows you to print any USPS mail classes along with adding special services like Certified Mail or USPS Tracking. Plus, buying your postage online gives you discounts you can’t even get at the Post Office. Our free software (download here) will connect you via the Internet to your Stamps.com Postage Account. When you print postage, the postage amount will be deducted from your account. Stamps.com imports delivery addresses automatically from your MS Outlook, QuickBooks and many other popular address book and contact management software. You can add or edit addresses anytime. You can even print postage directly from MS Word, Outlook and Corel WordPerfect. Use the free Stamps.com 5 lb. 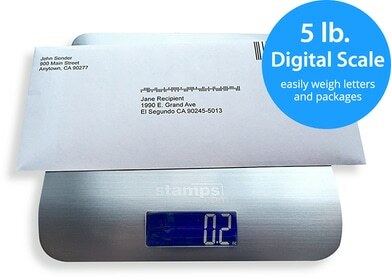 digital scale (just pay shipping and handling) to accurately weigh your envelopes or packages — you'll never overpay or underpay for postage again! The scale connects directly to your PC and integrates seamlessly with the Stamps.com software. If you need to weigh heavier packages you can upgrade to our 35 lb. scale anytime. Stamps.com allows you to buy the exact postage amount you need for your letter or package. You can print your postage on standard labels, envelopes or plain paper. In addition, Stamps.com will give you an estimate of the delivery time of all available USPS services, so you can choose the most cost-effective mail class based on your needs. Stamps.com uses the USPS database to validate your delivery address, ensuring fast, accurate delivery. Stamps.com can even send an email to the recipient to inform them that the package is on its way. Simply apply your Stamps.com postage to your mailpiece and either hand your letters and packages to your Postal Carrier, schedule a USPS pick up, drop them at the Post Office (without standing in line) or put them in a mail collection box. Plus, when a package of 13 oz. or more displays postage printed from Stamps.com, the USPS allows you to bypass the 13 oz. limit restriction and drop it right in a mail collection box!